The actual title of Lindsay Maitland Hunt’s terrific new cookbook is Healthyish: A Cookbook with Seriously Satisfying, Truly Simple, Good-For-You (but Not Too-Good-For-You) Recipes For Real Life and isn’t that what we all really want?!! To be able to mostly cook healthily but not so much that we take all the fun out of eating and by extension, life? I know that’s what I generally strive for on a day-to-day basis and I’m guessing that if you’re here reading this, you probably do too. If so, you are going to love this Famous Fridays post (it’s been a while since I’ve been able to manage one) and this totally delicious, but still nutritious, Seeded Whole-Wheat Banana Bread. Wouldn't this be a great guilt-free way to celebrate the weekend?!! Lindsay, a former editor at Real Simple and BuzzFeed Food, has really got the pulse on how conscientious, but busy people want to eat on an everyday basis. Hence Healthyish is truly filled with recipes and tips that make it easier to make homemade food work with whatever your lifestyle happens to be. Her thinking behind writing the book was that there had to be a special reason to include these particular recipes because they could either make it easier, cheaper or more nutritious to cook at home than any she had seen before. And boy, has she done a good job! The book is chock full of creative but entirely doable dishes for breakfast, lunch, dinner, dessert and snacks, like Peanut Butter Granola, Loaded Baked Potato and Cauliflower Soup, Spiced Chicken and Chickpea Flatbread and even a single serve Chocolate and Peanut Butter Cookie, so you can indulge without overdoing it. That’s sort of the philosophy behind this banana bread. Unlike most quick breads that are really more like cake since they are loaded with sugar, butter, white flour and other goodies and can’t in good conscience be considered healthy for breakfast, this banana bread, can. It’s made entirely of whole-wheat flour, is light on sugar and full of healthy seeds and nuts, which means that you can gobble down a slice or two in the morning and feel like you’re giving yourself a good start to the day! 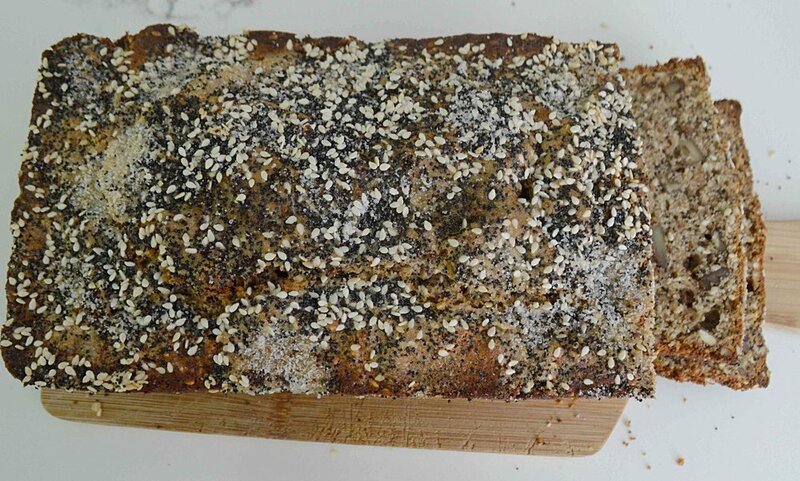 Plus, it’s not overly sweet and the poppy and sesame seeds give it a really satisfying crunch! Also, you can make the whole thing without a mixer and if you’ve got a few bananas lying around that are a little too ripe to eat as is, this is an excellent way to put them to good use. In Lindsay’s own words, “feel good, not sad” about what you eat and pick up a copy of Healthyish. It’s one of those cookbooks you’ll find yourself turning to again and again. Have an amazing weekend, cook up something yummy and “healthyish” and I’ll see you next week with more summery goodies and gab!! 1. Preheat oven to 350 and spray a 9x5-inch loaf pan with nonstick cooking spray with flour in it, or grease and flour the pan with softened butter or oil and flour. Tap out excess flour and set the pan aside. 2. In a small bowl, mix the 2 teaspoons of poppy and sesame seeds together with the tablespoon of sugar and set aside. 3. Place the flour, remaining poppy and sesame seeds, the baking powder and the salt in a medium bowl and whisk together well. Set aside. 4. Place the mashed banana, eggs, oil, remaining sugar and the vanilla in a large bowl and whisk together well. Fold in the dry ingredients with a large rubber spatula, just until combined. Then fold in the nuts. Scrape the batter into the prepared pan, smoothing out the top. Sprinkle the reserved seed mixture evenly across the top. 5. Bake the loaf for 50-60 minutes, until a tester inserted into the center, comes out with just a crumb or two attached. Cool the loaf in the pan on a rack for at least 30 minutes and then invert onto the rack (you might want to place a pan below to catch the wayward seeds) and let it finish cooling completely. 6. Slice and serve. The loaf keeps well-wrapped at room temperature for about 3 days or in the fridge for about a week. You can toast it a little to bring back that just-baked feel. Note: Recipe adapted from Healthyish by Lindsay Maitland Hunt.